Reprinted from The Canadian Numismatic Journal. Vol.63 No. 2 (March 2012) pp. 116–117, a publication of The Royal Canadian Numismatic Association rcna.ca Used with permission. Over Christmas of 2011 I had tons of time to write an article for the Journal, but somehow I was side tracked by some of my coins. Like other collectors, I have more than one Canadian large cent from 1859 and many that have been languishing in piles waiting to be studied, photographed and identified. That time has come, thanks to the efforts of Dr. James A. Haxby and friends. 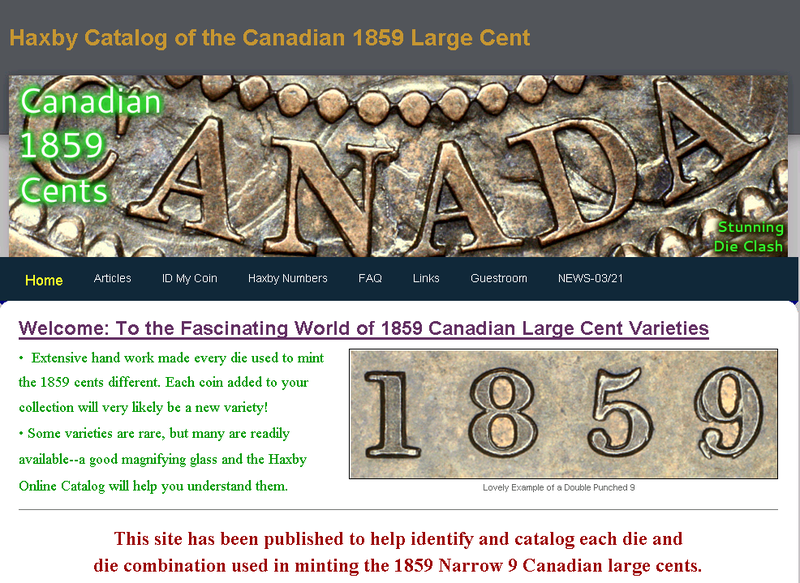 Haxby’s name is well-known in Canadian numismatic circles; in recent years not much has been heard from him, but now he has come back to give us a huge amount of information about the 1859 large cent. He started to put portions of this information in Numismatica Canada’s publication, but with its limited numbers of readers and his huge amount of information and photos, he decided it was time for a new method of delivery for the information he was already freely sharing. Thus, thanks to Haxby with help from friends we all now have free access to the information on a Web site at vickycents.com which is constantly growing and changing. More new information, continually being added by Haxby, is in the form of photographs and descriptions. At this time, 105 known obverse dies as well as 204 reverse dies are included. One of the great advantages of electronic delivery of his huge amount of information is that new discoveries as well as mistakes can be entered and corrected without addendums or waiting years for a second edition. As new items are added you can check the “News” button on the bar where recent changes are noted. Haxby and friends are known to frequent the discussion site at canadiancoppercoins.com where members are giving feedback, possible new discoveries and corrections, so that Haxby’s Web site is already like a half-printed second edition. At the time of my writing this article, the information about obverse dies is mostly complete while reverse die information is being added constantly. If your coin has a die crack on the obverse or double punched letters, chances are that within a few minutes, you will be able to identify your coin and give it a number from Haxby’s new numbering system. Because reverse dies became damaged beyond use much quicker than obverse dies did, there is a likelihood your coin’s reverse may be from one of a multiple of die marriages with its obverse die. Haxby has gone as far as describing all the known die states for the coins, so that as cracks and wear develop on the dies his descriptions will also help you identify which reverse was in use at the time of the strike. Haxby has found that his obverse die o45a was combined with at least 10 different reverse dies. One of those dies it was married with is the one with the 9 punched over an inverted 9. Many studied collectors of 1859 varieties use obverse markers as aids when making purchases of coins from photographs which may not show date varieties. Often, familiarity with known die cracks will increase these collectors’ chances of successfully purchasing non-attributed or miss-attributed rarities. With this fantastic amount of information available to everyone with Internet capabilities, it is now possible to put all those 59’s into an organized matrix. Haxby’s Web site is another opportunity to know your quarry and increase your chances for success in collecting and studying Canadian coins.